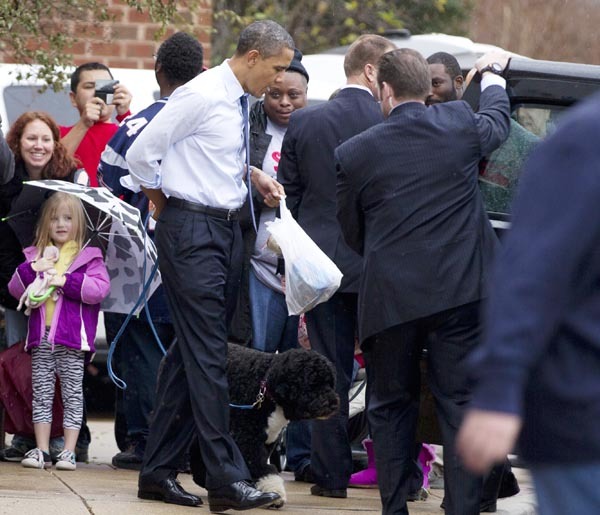 Obama squeezes in time after calls with congressional leaders to do some impromptu Christmas shopping with first dog Bo. ALEXANDRIA, Va. — Home alone at the White House, President Barack Obama headed on an impromptu Christmas shopping trip today with first dog Bo, searching for some holiday cheer despite the latest stalemate with Congress. The president’s wife and daughters already are on the family’s annual Hawaii vacation, leaving him behind to negotiate with Republican lawmakers to keep payroll taxes from going up in the new year. So Obama squeezed in time after calls with congressional leaders to hit a PetSmart and a Best Buy in this Virginia suburb before picking up pizza for lunch. Along the way he wished Merry Christmas and happy holidays to dozens of thrilled bystanders in this politically important state less than a year out from the 2012 presidential election, and days from Christmas and an end-of-year deadline to reach a deal with Congress or see taxes rise and unemployment benefits expire on millions of Americans. At the pet store the president bought Bo a toy bone and a bag of treats, as the presidential pup played with a poodle puppy named Cinnamon. “OK, Bo, don’t get too personal” Obama admonished at one point as the two dogs sniffed each other in excitement. From there Obama headed to Best Buy to shop for his daughters, Malia, 13, and Sasha, 10. He purchased two $50 iTunes gift cards and two games — the Sims 3: Pets and Just Dance 3 for the Wii. Obama spent over $190 and put it on a credit card, first remarking to store employees, “It’ll be really embarrassing if it doesn’t go through.” But there was no problem. Then it was time for lunch. The president hit Del Ray Pizzeria and picked up three pies to go, stopping on the way out to greet screaming onlookers, dispense holiday wishes and pose for pictures with kids. “I love you!” someone screeched. But even among the upbeat holiday crowds Obama encountered a bit of friendly criticism over a Canada-to-Texas oil pipeline he has delayed, creating a jobs issue for Capitol Hill Republicans. “I just said I disagreed with him on the pipeline but I love what he’s doing for the country otherwise,” John Passacantando, 50, of Alexandria said after meeting Obama. The last group of onlookers Obama met invited him to their office holiday party at their Internet development company. But the president regretfully declined. It was time for him to head back to the White House.